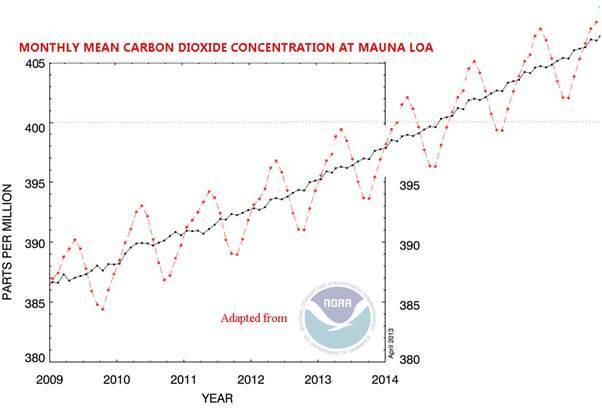 An epochal-symbolic threshold: the CO2 concentration at Mauna Loa has exceeded 400 ppm! It was in the air for days, and it has also created a certain expectation, with trepidation. Similarly as when we are awaiting the outcome of a surgery for a family member. But this event has nothing to rejoice. The question is very simple. At the Mauna Loa observatory, CO2 values ​​whose average over an entire day was greater than 400 ppm were recorded. One ppm means one part per million. That is to say, on a million of air molecules, 400 are CO2. It seems a small and harmless number. But it is not, unfortunately. Because these small quantities of gas are those that regulate the greenhouse effect on our planet. 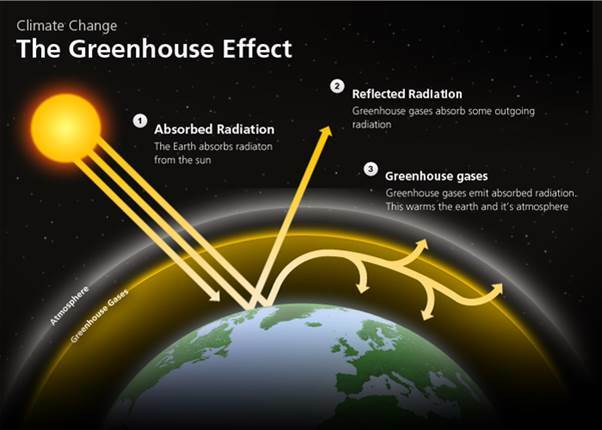 The greenhouse effect on Earth is responsible for the fact that the average global temperature, instead of being equal to a chilling value of -18°C, is approximately 15°C, a value much more livable for our species. And this happens thanks to the presence of a number of components, in the terrestrial atmosphere, which leave no escape throughout the infrared radiation that the Earth emits, but retain a certain part. It is a positive effect, then. More greenhouse gases there are in the Earth-atmosphere system, the more the greenhouse effect is big. Variations are small, almost imperceptible, few tenths of a degree, but accumulated can lead to large variations. The greenhouse effect in short. Few words on Mauna Loa observatory. Where is it? Here, on Hawaii islands. 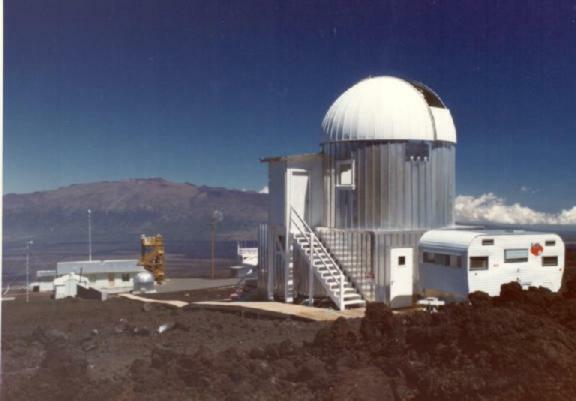 An image of Mauna Loa Observatory. Erected in 1956, the first CO2 measurements date 1958, thus it is the most ancient observatory measuring CO2 on Earth. Somebody criticizes the choice of the site as nearby there is the Kilauea volcano, whose emissions may affect the measurements. However, the observatory altitude is 3397m, and its elevation and location (in the middle of the Pacific ocean, away from major air pollution sources) make this site as an ideal place to sample the atmosphere. The high elevation of the observatory keeps also far away the lower local pollutants emitted below the observatory (such as also volcanic emissions), due to fact that it is quite higher than the strong marine temperature inversion layer present for most of the time in the region. 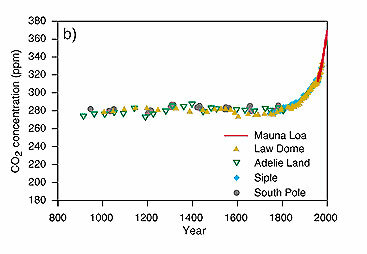 An “a posteriori” demonstration of the quality of these data is the comparison of the CO2 trend of the Mauna Loa data (1.64 ppm per year) with the global trend (1.66 ppm per year), calculated considering the average of all remote stations in the world: they are statistically indistinguishable. Global atmospheric CO2 (NOAA) versus Mauna Loa CO2 (NOAA). Credits: Skeptical Science. Let’s now came back to the original point. Yesterday, daily mean CO2 concentration has exceeded 400 ppm. It did not happen for about 3 million years. That means this has never happened since man lives on Earth. 400 ppm is a symbolic epochal threshold for the humanity.. The news is not yet official but, after the graph produced by NOAA (National Oceanic Atmospheric Administration), here reported (that on the link is regularly updated), the U.S. federal agency that deals with climate, the CBS has released yesterday a service confirming the measure. 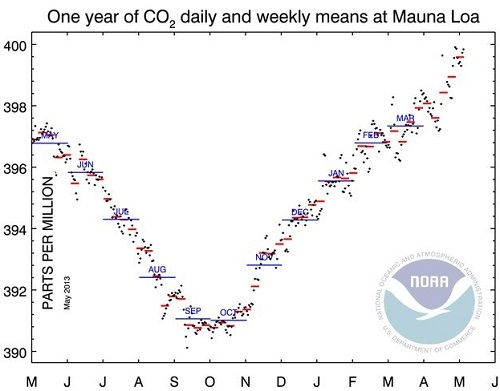 Last year daily and weekly CO2 concentrations at Mauna Loa. It must be emphasized, once again, that the carbon dioxide enters the atmosphere as a result of the human use (and abuse) of fossil fuels: oil, gas, coal, methane, etc. Since we have started to use them (which means, since the Industrial Revolution, or even better, since the invention of the Watt machine), the history and prehistory of the human race have been accompanied by a carbon dioxide concentration lower than 300 ppm. 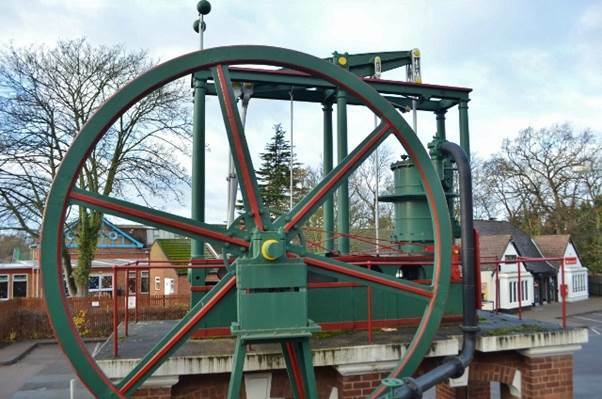 A preserved Watt beam engine at Loughborough University. Credits: Ashley Dace. Still in the middle of the eighteenth century, it was equal to 280 ppm. Then, it started its apparently unstoppable growth till the actual values of 400 ppm. CO2 in last 1200 years. Credits: IPCC AR4. We said that our Earth experienced for the last time an atmospheric concentration of carbon dioxide of 400 ppm about three millions years ago, i.e. before the appearance of the so-called Homo sapiens. At that time, the temperatures were 3-4°C higher than now, and the sea level was about 25 meters higher than now. 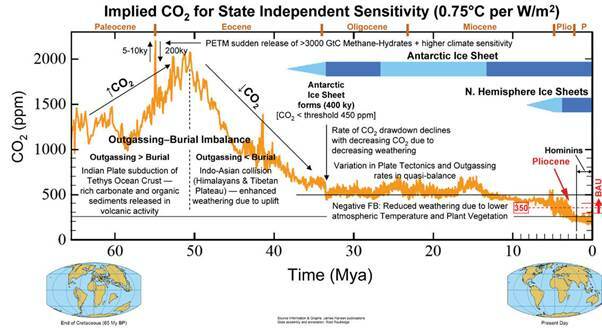 Reconstruction of the atmospheric concentration of CO2 in the last 65 million years: in the distant geological past, there have been periods when this greenhouse gas was vastly more abundant than today. For example, between the Paleocene and Eocene, around 50 to 55 million of years ago, it was about 2000 ppm. But this comparison cannot reassure about the current situation. At that time, indeed, the planet was completely different, with a different geology, climate and environment, and even some prehistoric human species existed. But today we live in a world more and more overcrowded, short of natural resources and plagued by numerous criticalnesses (environmental, demographic, social, economic and alimentary) that make humanity fragile in the face of abrupt climate change. During the Pliocene (between about 3 and 5 million years ago, red line), for the last time before today, a CO2 concentrations next to 400, sometimes 500 ppm was reached. Source: alpineanalytics.com. 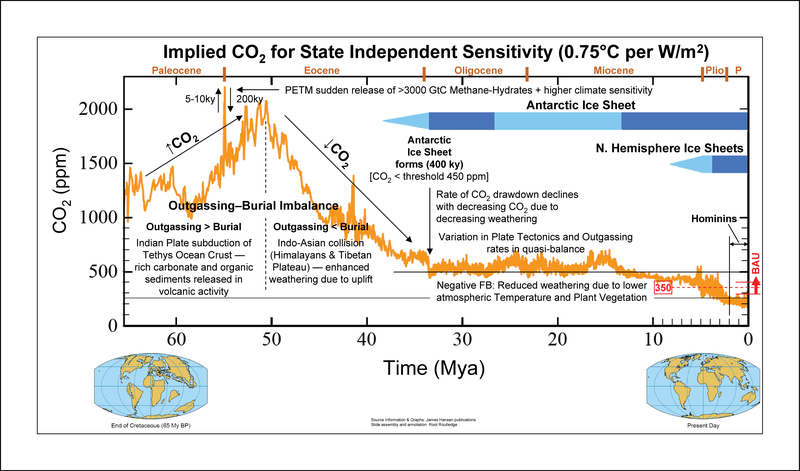 Reconstruction of the atmospheric concentration of CO2 in the last 65 million years: in the distant geological past, there have been periods when this greenhouse gas was vastly more abundant than today. For example, between the Paleocene and Eocene, around 50 to 55 million of years ago, it was about 2000 ppm. But this comparison cannot reassure about the current situation. At that time, indeed, the planet was completely different, with a different geology, climate and environment, and even some prehistoric human species existed. But today we live in a world more and more overcrowded, short of natural resources and plagued by numerous criticalnesses (environmental, demographic, social, economic and alimentary) that make humanity fragile in the face of abrupt climate change. During the Pliocene (between about 3 and 5 million years ago, red line), for the last time before today, a CO2 concentrations next to 400, sometimes 500 ppm was reached. Source: alpineanalytics. Usually, CO2 concentration shows a marked annual cycle, due to the effect of the vegetation respiration: for this reason, the cycle is much more evident in the midlatitudes of the northern hemisphere, where the vegetation covers more extensively the Earth surface. Normally, during the first half of May, the carbon dioxide reaches the “peak” year: the concentration decreases after the forests of the northern hemisphere have completed the foliation. Thus, this year the epochal peak of 400 ppm has been exceeded almost at the end of the increasing period, and soon the mean value will come back below 400 ppm. But, year after year, the peak always grows. A rough graphic simulation carried out by myself using the monthly (monthly, not daily: this is way the value is significantly lower than 400 ppm!) data measured at Mauna Loa (I have just graphically repeated the last year trend; yes, I know, very rough, but it gives the idea) shows that we have still two years in which we could see some values with daily or monthly values lower than 400 ppm. Then, after 2016, we will enter in a new era: the above 400 ppm CO2 era. 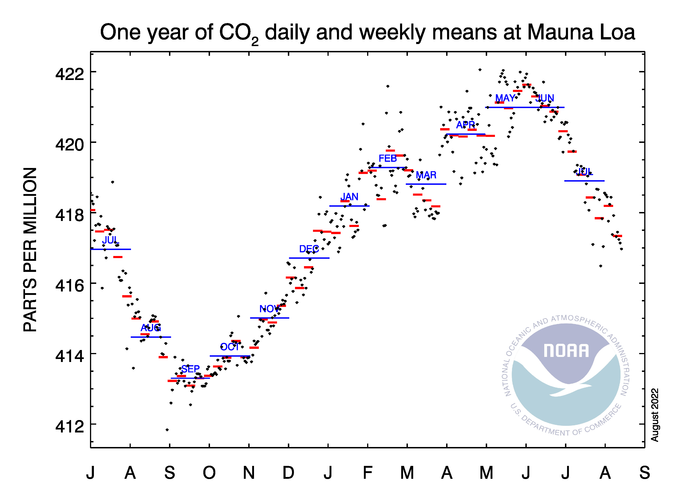 Monthly mean carbon dioxide concentrations measured at Mauna Loa (until April 2013) and hypothized for the next three years by continuing the last year trend. It is evident as September and October 2014 risk to be the last months with a CO2 monthly mean value below 400 ppm. If you do not trust my rough projection, you may enjoy in watching this video, that shows the time history of atmospheric carbon dioxide from 800,000 years before present until January, 2012 (and it is possible to imagine how it will continue). By the way, the video shows that, at high latitudes, the 400 ppm threshold has already been exceeded in some months several years ago. But here we are talking about Mauna Loa, Hawaii: which is located in an equatorial area and is representative of the world mean (remember the first figure). And, as now people “old” like me is surprised by thinking that the first year university students had never experienced a world without mobile phone (and few year later we may repeat the same discussion for smartphones, facebook, twitter, …), some years later the young generation will be born in an above-400-ppm-CO2-era. The effects of increased concentrations of greenhouse gases are not immediately evident. Until now, the planet’s average temperatures has increased only by 0.8°C with respect to before the Industrial Revolution, but already many people complain that no longer exist transition seasons and seasons are no longer those known in the past. The following video from NASA summarizes in 30 seconds how world temperatures have changed in the past 120 years. The climate destabilization triggered by greenhouse gases that humans have released into the atmosphere also manifest in the increase of extreme weather events: heat or cold waves, drought and floods. The cold spring in western Europe and a big portion of US, for example, is probably a side effect of the massive melting of Arctic ice which took place last summer. While talking of spring temperatures, let’s give a look on a global map. Here it is shown the map referring to the first two months of 2013 spring (we remember here that meteorologists count seasons starting from the first day of the month, so spring means March, April and May). I have decided to underline these data, as I am reading a lot of nonsense related to actual weather. The map reveals that there are some areas characterized by dark blue, which means cold. These areas (Canada, US and Europe) are densely populated by industrialized humans. There are also several areas characterized by quite large warm anomalies, but they concern some underpopulated, or not populated at all, areas of the planet. This is why we heard only about cold, and nothing about warm. We care only about what happens where we live. But climate do not make such distinctions, and from a climatological point of view, US and Antarctica are equal! 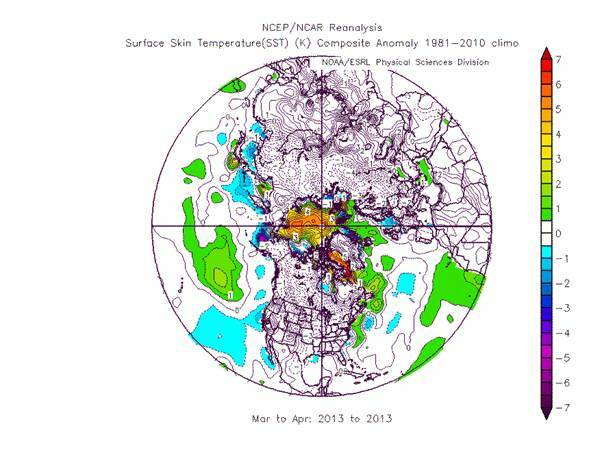 Anomaly of surface temperatures recorded during March and April, 2013, with respect to the period 1981-2010. A large cold area covers a big portion of North America and another one covers most of Europe, while central Asia, Africa, Greenland and both polar regions are experiencing unusually warm periods. Source: NCEP-NCAR. The temperature anomalies appear to be strongly connected with the corresponding anomalies of the geopotential pattern at 500 hPa. 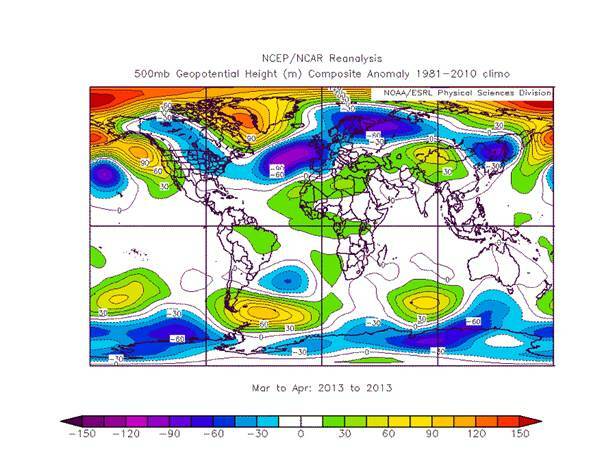 Anomaly of 500 hPa geopotential height recorded during March and April, 2013, with respect to the period 1981-2010. Note the almost perfect coincidence between cold areas and areas with negative 500 hPa anomaly. Source: NCEP-NCAR. 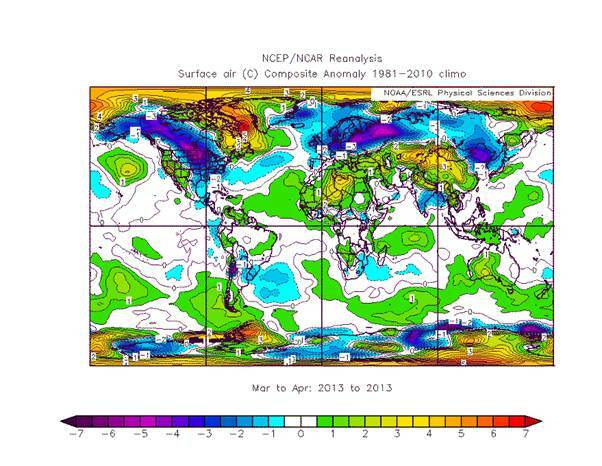 Anomaly of SST recorded during March and April, 2013, with respect to the period 1981-2010. Note the almost perfect coincidence between cold areas and areas with negative 500 hPa anomaly. Source: NCEP-NCAR.